Woman enjoy nice view in Machu Picchu, view from the back. Machu Picchu from right side view. Tourists on Machu Picchu. Back view of the tourist woman standing aboard a ferry and looking around. Female enjoying the view. Back view of young couple sitting at the edge of cliff and resting. Tourist man and woman enjoying the beautiful view. Back view of young woman walking with backpack near the Eiffel tower in Paris, France. 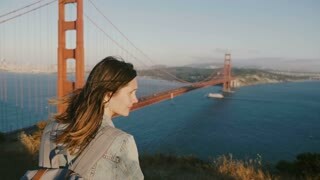 Tourist enjoying the view. Back view of happy tourist girl with flying hair enjoying Brooklyn Bridge view in New York from embankment, arms open. 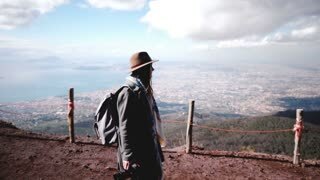 Side view of young beautiful female tourist with backpack hiking down from Vesuvius volcano enjoying view of Naples. Back view shot of happy peaceful young woman tourist enjoying atmospheric gondola trip along Venice canals in Italy. 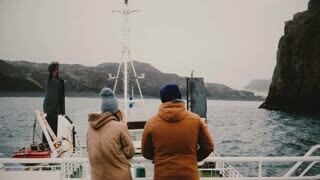 Back view of man and woman standing on ship and enjoying beautiful landscape, talking. Tourists exploring Iceland.